Grammatical Framework (GF) is a grammar formalism and a programming language for multilingual computational grammars. It is based on the idea of a shared abstract syntax and mappings between the abstract syntax and concrete languages. GF has hundreds of users all over the world. The GF Resource Grammar Library (RGL) implements the morphology (inflection) and basic syntax (phrase structure) of more than 30 languages: Afrikaans, Bulgarian, Catalan, Chinese, Danish, Dutch, English, Estonian, Finnish, French, German, Greek, Hindi, Interlingua, Japanese, Italian, Latvian, Maltese, Mongolian, Nepali, Norwegian bokmål, Nynorsk, Persian, Polish, Punjabi, Romanian, Russian, Sindhi, Spanish, Swedish, Thai, and Urdu. These resources are freely available as open-source software. We are constantly welcoming new languages, especially from new language families, including African languages. Learn more at the RGL status page. The summer school is an excellent place to get started with a new language. You will find the GF book a very good companion to your studies (available also as an e-book). However, the book is not a requirement for successful participation in the summer school. Please note that the first 20 participants from South Africa and Africa to complete the above form will receive free accommodation in a university residence. A further 20 places will be available at R250.00 per person per night. Logistically, accommodation is the most pressing matter, since Stellenbosch is a very popular holiday and tourist destination all year round. December is the main holiday season in South Africa and it is essential to ensure that you book your accommodation as soon as possible. The good news is that accommodation and food are relatively cheap, compared to European prices. 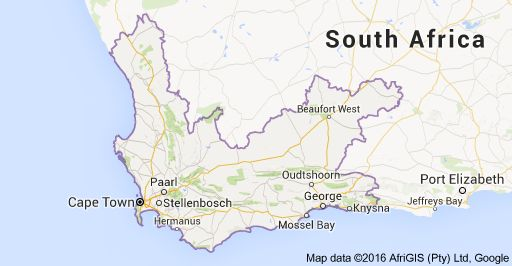 Stellenbosch does not have a public transport system suited to tourists, although Uber operates in the area. 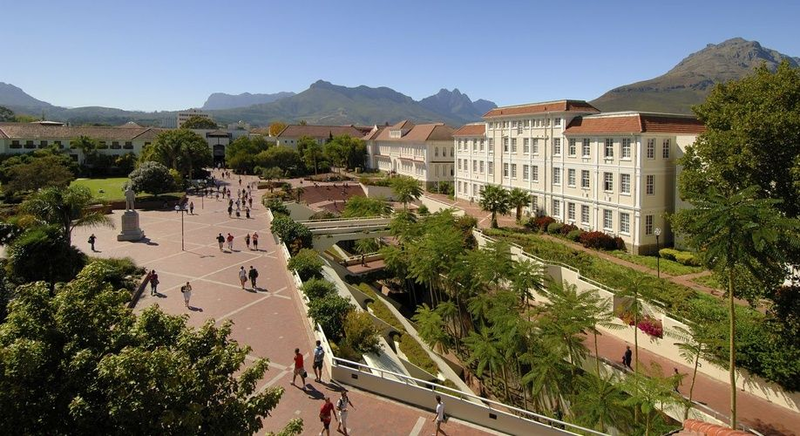 Therefore, we recommend choosing accommodation within walking distance of the university campus. 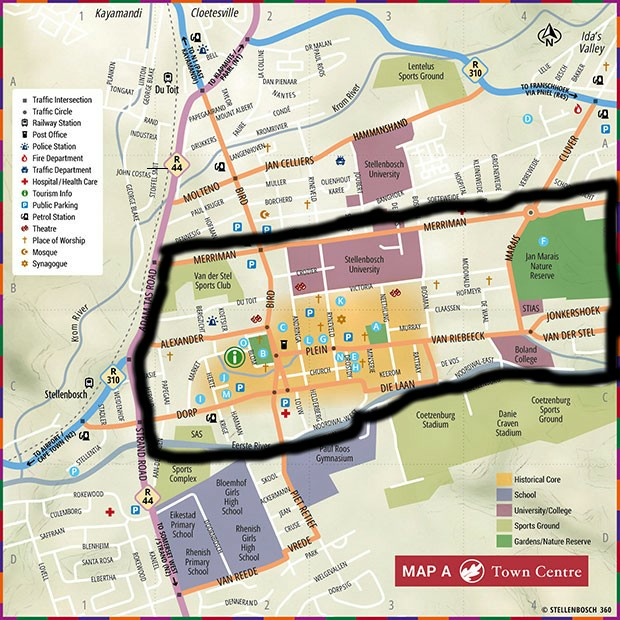 Please refer to the map in Figure 1 below for the recommended area in case you are booking your own accommodation. You may also find the list in Table 1 useful. University residence accommodation: We have made a block reservation in a nearby university residence for 40 people - mostly single rooms, although sharing is possible (R250.00 ~ €17 per person per night, bedding included, no meals). These rooms are basic, with communal ablution facilities. If you are interested in making use of this type of accommodation, kindly complete the following form before August 31st September 30th: Accommodation. 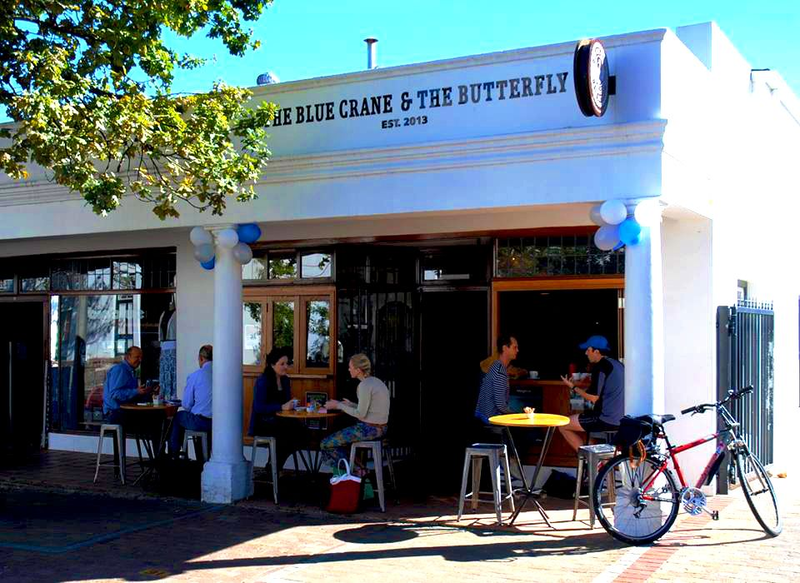 Basic accommodation: We can also recommend basic accommodation (dormitory-like) in either the Stumble Inn or Ikhaya Backpackers. It may even be cheaper than the residence accommodation. Please direct your enquiries to the mentioned entities. This option is very popular amongst tourists, and making a timely reservation is strongly advised. More upmarket accommodation: If you prefer something slightly more upmarket, there are many options for accommodation within walking distance of the venue. Please check out Booking.com, Airbnb.com, and many others, as provided on our list of recommended accommodation while also referring to Figure 1. While Stellenbosch is known for its many safe and beautiful neighbourhoods, Kayamandi, Cloetesville, Idasvallei and La Collinne are best avoided. When booking through accommodation websites, please ensure that the street address does indeed fall within the area demarcated in Figure 1. This option is very popular amongst tourists, and making a timely reservation is strongly advised. Do not hesitate to direct any questions about accommodation, location or other practical matters to the local organiser. 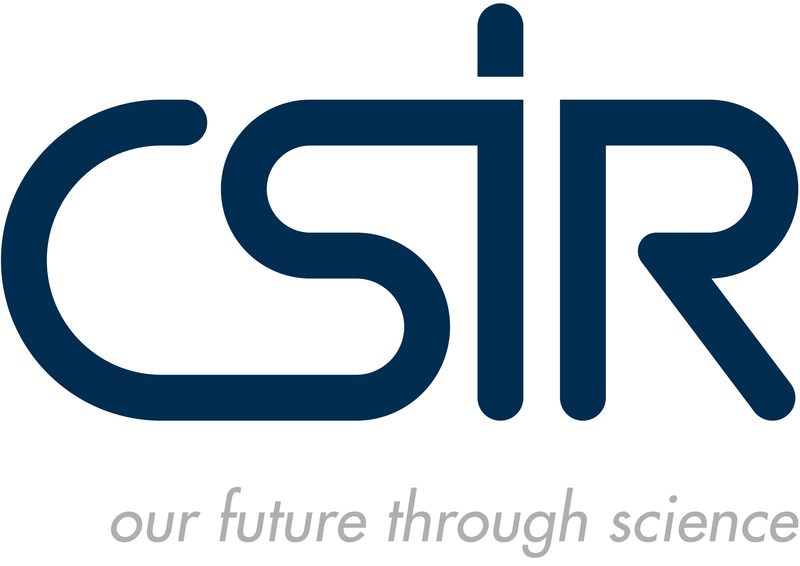 The summer school will take place in Stellenbosch, home to Stellenbosch University. 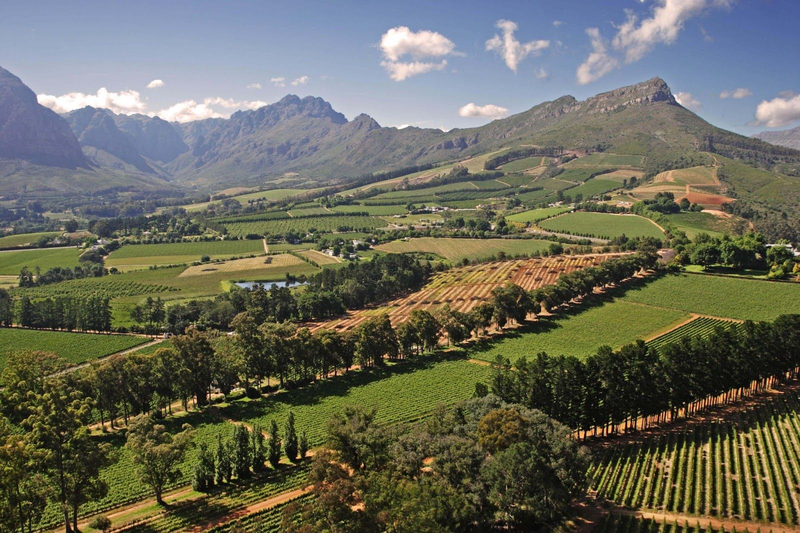 Stellenbosch is one of the most beautiful towns in South Africa and even in the world! It is a university town and tourist destination. It is particularly well ­known for its wine, hiking, culture and university. It is close to Cape Town, one of the capital cities of South Africa – a city which is often ranked amongst the top ten best cities in the world for tourism. 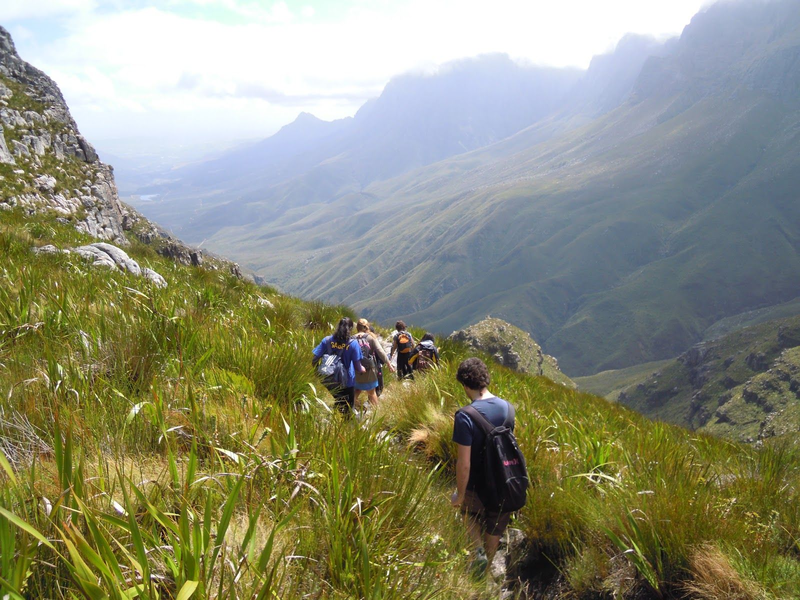 The official site of the Stellenbosch Tourism and Information Bureau is at http://www.stellenbosch.travel/. Many of the main airlines operate direct flights to Cape Town. For specific airlines and specific flights one should compare the direct flight options to the option of flying to Johannesburg and then to Cape Town, using a domestic carrier (see below). There are many budget airlines that operate between Johannesburg and Cape Town. At the time of writing (19 March 2018), for a return trip on 2 and 15 December, the cheapest prices range from about R1750 (117.79 Euro; 145.06 USD) to just over R2000 (134.58 Euro; 165.85 USD). Other options include South African Airways and British Airways. Should you require a letter of invitation to the summer school, please contact Laurette Pretorius. Participants are required to bring along their own laptops to the summer school. Wifi will be available at the venue. Electrical plugs: D, M and N. Type M, a three-point plug, is considered the standard. See here, here and here for more information. Do not hesitate to direct any questions about accommodation, location or other practical matters to the local organisers.